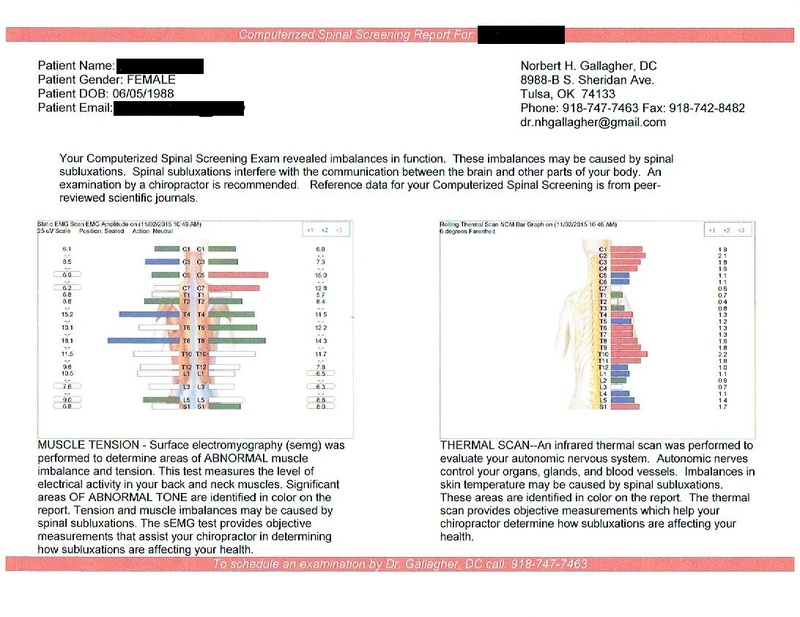 These are scans from a current patient of ours who came in originally because of some neck and back pain but also to see if it would help with fertility issues she has had over the last few years. She is an avid Young Living Essential Oils user so had covered all of the necessary protocols with them, but still wasn't getting quite the results she needed. After two miscarriages she finally decided to give chiropractic a shot. She Started care at our office the beginning of November and has been coming in 3x a week since then, and as you can see, not only have her scans significantly improved, but she informed us that she is now pregnant as well! You would think that after a few miscarriages, she would have an underlying fear of it happening again, but through the power of chiropractic she feels more than confident that her body has accepted this and is ready and able to safely carry her child! On top of that her back and neck have shown great improvement in the pains that she was feeling when she first started. And remember, this was all in the matter of ONE MONTH of regular Chiropractic care! Just imagine what a lifetime of chiropractic can do for you and your family! Surface electromyography (semg) was performed to determine areas of ABNORMAL muscle imbalance and tension. 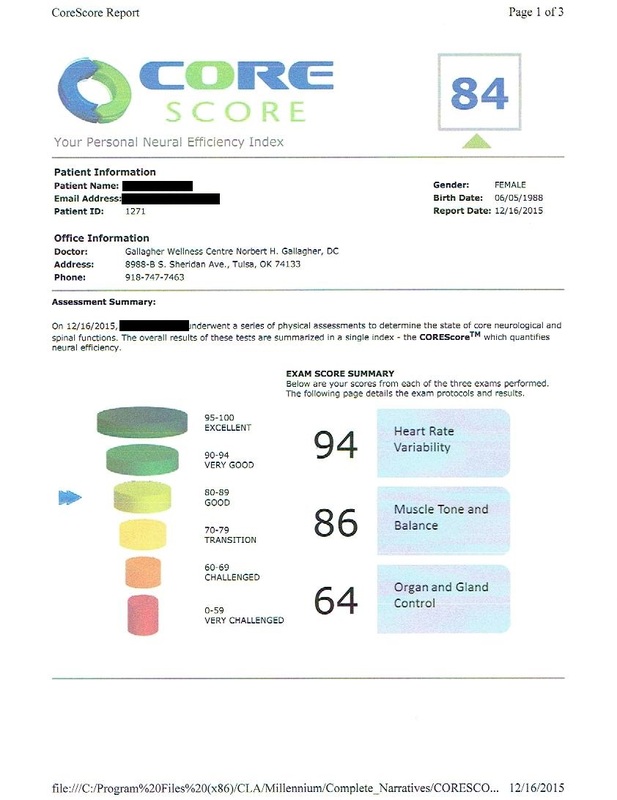 This test measures the level of electrical activity in your back and neck muscles. 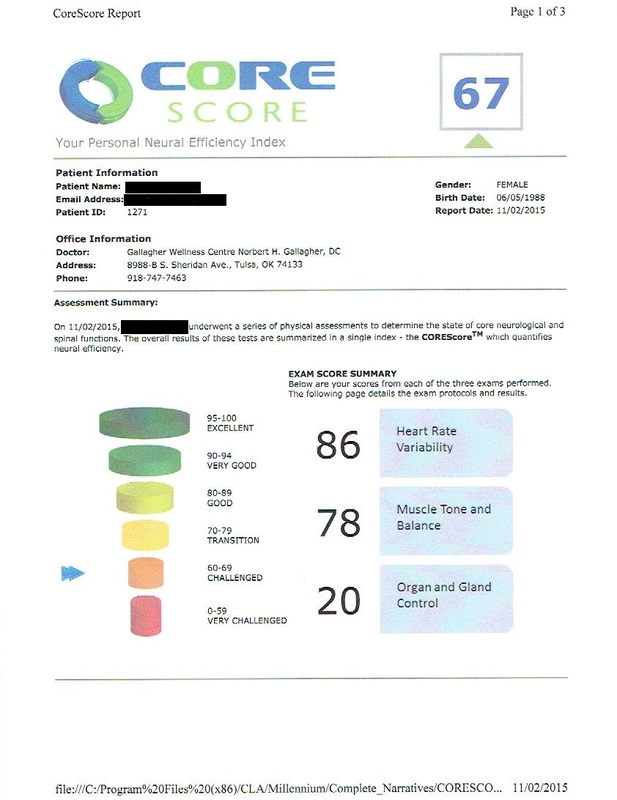 Significant areas OF ABNORMAL TONE are identified in color on the report (ranging from (slight) green-blue-red-black(extreme)). Tension and muscle imbalances may be caused by spinal subluxations. 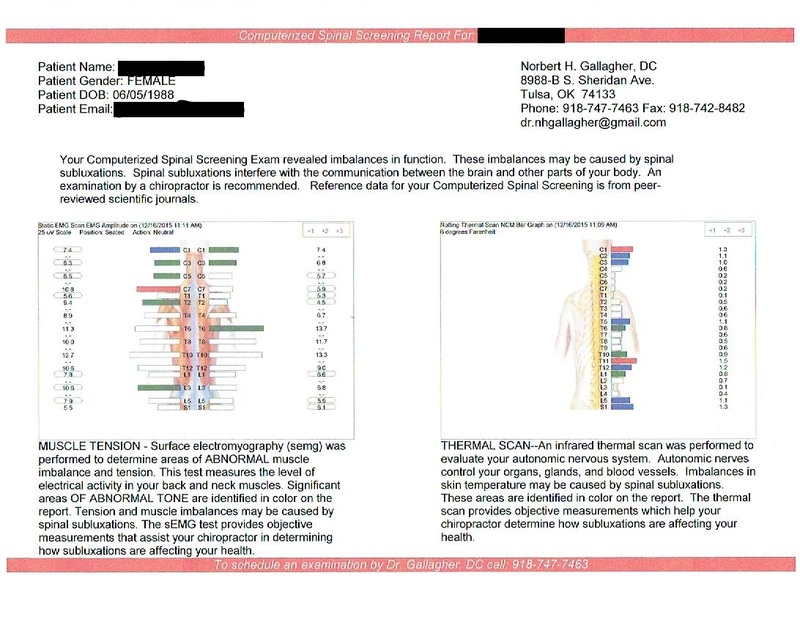 The sEMG test provides objective measurements that assist your chiropractor in determining how subluxations are affecting your health. An infrared thermal scan was performed to evaluate your autonomic nervous system. Autonomic nerves control your organs, glands, and blood vessels. Imbalances in skin temperature may be cause by spinal subluxations. These areas are identified in color on the report. The thermal scan provides objective measurements which help your chiropractor determine how subluxations are affecting your health. Heart Rate Variability (HRV) testing is a simple and accurate test that uses complex mathematical calculations to analyze the rates and rhythms of the resting heart beat pattern. The data can be evaluated to reveal the intricate balance between the Sympathetic(S) Nervous System and the Parasympathetic Nervous System (PS). The Pulse Wave Profiler (PWP) is research-grade equipment that allows the staff or doctors to quickly assess the effect that long term stress is having on the general state of a patient’s well-being.